Epidemiological evidence confirmed that raw cow’s milk consumption in the first year of life protects against the development of atopic diseases and increases the number of regulatory T-cells (Tregs). However, milk’s atopy-protective mode of action remains elusive. This review supported by translational research proposes that milk-derived microRNAs (miRs) may represent the missing candidates that promote long-term lineage commitment of Tregs downregulating IL-4/Th2-mediated atopic sensitization and effector immune responses. Milk transfers exosomal miRs including the ancient miR-155, which is important for the development of the immune system and controls pivotal target genes involved in the regulation of FoxP3 expression, IL-4 signaling, immunoglobulin class switching to IgE and FcϵRI expression. Boiling of milk abolishes milk’s exosomal miR-mediated bioactivity. Infant formula in comparison to human breast- or cow’s milk is deficient in bioactive exosomal miRs that may impair FoxP3 expression. The boost of milk-mediated miR may induce pivotal immunoregulatory and epigenetic modifications required for long-term thymic Treg lineage commitment explaining the atopy-protective effect of raw cow’s milk consumption. The presented concept offers a new option for the prevention of atopic diseases by the addition of physiological amounts of miR-155-enriched exosomes to infant formula for mothers incapable of breastfeeding. Children who grow up on traditional farms are protected from atopic diseases . Early-life consumption of unboiled cow’s milk has been identified as the most protective factor for the development of atopy [2–10]. Farm milk exposure has been associated with increased numbers of CD4+CD25+FoxP3+ regulatory T cells (Tregs), lower atopic sensitization and asthma in 4.5-year-old children . Treg cell numbers are negatively associated with asthma and perennial IgE levels . However, potential effectors of milk, which stimulate the development of Tregs remain elusive. This review provides translational evidence that milk-derived exosomal microRNAs may be the potential stimuli for thymic Treg maturation and raw milk-mediated atopy prevention. Atopic allergy is a Th2 cell-mediated disease that involves the formation of specific IgE antibodies against innocuous environmental substances. Both naturally occurring thymus-derived and inducible Tregs of the periphery prevent allergy development via suppression of Th2 cells [12–14]. Decreased FoxP3+ Treg numbers have been detected in atopic mothers at the 34th week of gestation, in cord blood in association with high IgE levels, in sputum, nasal secretions and blood of atopic patients pointing to the pivotal role of FoxP3+ Tregs in the immunopathogenesis of atopy [15–18]. Scurfy is an X-linked recessive severe murine autoimmune disease resulting from a Foxp3 mutant . The human analog is the immune dysregulation, polyendocrinopathy, enteropathy, X-linked (IPEX) syndrome associated with eczema and increased IgE levels caused by impaired function of Tregs due to mutated FOXP3. In the X-linked immunodeficiency disorder Wiskott-Aldrich syndrome (WAS) the mutated WAS protein (WASP) plays the key role in impaired Treg suppressor function [20, 21]. WASP knockout mice display decreased numbers of Treg cells in both the thymus and peripheral lymphoid organs . Tregs control the severity of anaphylaxis , contribute to the resolution of Der p1-induced allergic airway inflammation , and inhibit allergen-specific effector cells important for the successful outcome in allergen-specific immunotherapy . Thus, Tregs are central players in the pathogenesis and treatment of atopy [26, 27]. The vast majority of Tregs is generated in the thymic medulla at the CD4+ single-positive stage of thymocyte development [28, 29]. Tregs highly express FoxP3, the master regulator for Treg cell differentiation and function [30–32]. Whereas naturally occurring Tregs are educated in the thymus, inducible Tregs can be generated in the periphery [26, 33–41]. FoxP3+ T cells are detectable in the periphery 3 days after birth during the period of colostrum feeding . Hassall’s corpuscles in the thymic medulla secrete thymic stromal lymphopoietin (TSLP) that activates CD11c+ dendritic cells (DCs), which induce Foxp3 expression in immature CD4+CD8-CD25- thymocytes [42, 43]. Crucial for FoxP3 induction are early signals from the T cell receptor (TCR), interleukin-2 (IL-2), transforming growth factor-β (TGF-β), and Notch1 [44, 45] (Figure 1). Potential mechanisms of milk exosome miR-155-mediated FoxP3 expression in Tregs. TCR activation upregulates CD25 and subsequent IL-2/STAT5 signaling, which cooperatively with TGFβ-activated SMAD5 stimulate the FOXP3 promoter. MiR-155 attenuates the expression of SOCS1, the inhibitor of STAT5, thus amplifying IL-2/STAT5-mediated FoxP3 expression. FoxP3 activates the bic promoter enhancing the synthesis of miR-155, which suppresses mRNAs of GATA3 and IL-4, pivotal transcription factors of Th2-mediated IgE-driven atopic immune responses. MicroRNAs (miRs) are fundamental regulators of posttranscriptional programs that play a role in maturation and differentiation of Tregs in the thymus [46–49]. Substantial evidence underlines that miR-155 is required for the development of the Treg lineage . MiR-155-deficient mice have reduced numbers of Tregs both in the thymus and periphery . FoxP3, which is highly expressed in Tregs, binds to the promoter of bic, the gene encoding miR-155 [40, 50, 51]. TCR and Notch signaling upregulates the IL-2R α-chain (CD25), rendering thymocytes receptive to subsequent cytokine signals that foster their development into fully functional FoxP3+ Tregs [52–54]. IL-2 is capable of transducing signals in CD4+FoxP3+ Tregs as determined by STAT5 phosphorylation . Deletion of miR-155 results in limited IL-2/STAT5 signaling and reduced Treg numbers . 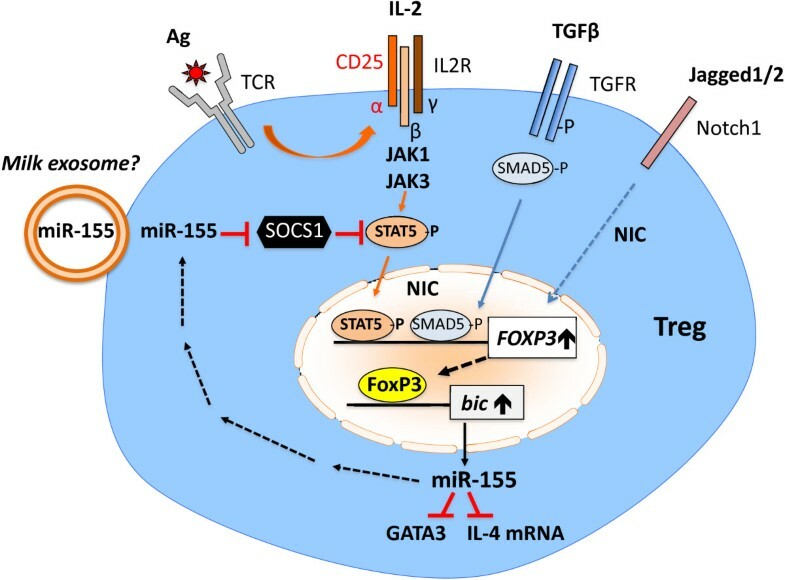 Remarkably, miR-155 enhances FoxP3 expression by targeting suppressor of cytokine signaling 1 (SOCS1), an important negative regulator of IL-2R/STAT5 signaling (Figure 1). MiR-146a targets STAT1 and regulates Treg-mediated suppression function and maintains Treg identity . Deletion of miR-146a in Tregs causes a severe autoimmune phenotype akin to Dicer knockout animals, characterized by increased numbers of poorly functional FoxP3+ Tregs in the periphery . MiR-21 is highly expressed in Tregs and positively regulates FOXP3. MiRs are processed in the cytoplasm by the ribonuclease Dicer. Conditional knockout of Dicer in CD4+ cells results in depletion of thymic Tregs and suppressed TGF-β-mediated induction of Foxp3 in naïve CD4+ cells associated with increased IL-4 levels . Dicer knockout mice as well as mice with conditional knockout of Dicer in FoxP3+ cells develop severe autoimmune diseases [58, 59]. In the later model, FoxP3 expression is unstable and Treg revert to an effector phenotype producing IL-4 and IFN-γ. Notably, miR-155 negatively regulates mRNA levels of GATA-3 and IL-4 . It is well known that GATA-3 promotes Th2 responses . In miR-155 null mice increased Th2 cell differentiation has been reported [62, 63]. Valadi et al. were the first who demonstrated that exosome-mediated transfer of mRNAs and microRNAs is a novel mechanism of genetic exchange between cells. Secreted miRs represent a newly recognized layer of gene regulation and intercellular communication [65–67]. MiRs bind through partial sequence homology to the 3′-untranslated region of target mRNAs and cause either translational block or mRNA degradation . Exosomal miRs, enclosed by membranous microvesicles, play a pivotal role for horizontal miR transfer . Raposo et al. provided first evidence for exosome-mediated immune cell communication. Unidirectional transfer of miR-loaded exosomes from T cells to antigen-presenting cells has recently been confirmed . For immune cell-cell interactions exosome transport exchanging genetic messages over distances has been demonstrated [72, 73]. In the human thymic medulla miR-transporting exosomes that may provide genetic signals required for Treg formation have recently been characterized . Milk-derived exosomal miRs: boosters for thymic Treg maturation? Recently, we have suggested that milk is an endocrine signaling system that promotes mTORC1 signaling by transfer of essential branched-chain amino acids and exosomal regulatory miRs to the milk recipient . Zhang et al. published that diet-derived plant MIR168a reaches the plasma compartment of human subjects and affects LDLRAP1 metabolism in the liver . However, Dickinson et al. were unable to detect plant miRs after feeding in mice. Breast milk in comparison to all other body fluids contains the highest amounts of total RNAs . Bovine and human milk contain substantial amounts of exosomal miRs that may be transferred to the infant to promote immune regulatory functions [79–81]. MiR-containing exosomes of 30-100 nm diameter have been identified in human breast milk, cow’s milk, bovine whey and colostrum [83–85]. Exosomes from bovine colostrum and mature milk are able to deliver miRs into cultured cells thereby increasing cytoplasmic miR levels . Although not proven yet, several investigators regard milk-derived miRs as important effectors for the development of the infant’s immune system and proposed that milk’s miRs may reach the infant’s circulation and organ systems [81, 85–87]. Admyre et al. demonstrated that incubation of human PBMCs with isolated human milk exosomes increased the number of CD4+CD25+FoxP3+ Tregs in a dose-dependent manner. Human and bovine milk contain significant amounts of those immune regulatory miRs (miR-155, miR-146a, miR-21) that play a known role in thymic Treg differentiation [80, 81, 85, 87]. Bovine colostrum in comparison to mature milk contains the highest amounts of miR-155 and miR-21 [80, 81]. Substantial exosomal miR-155 content has been detected in bovine whey . The lipid bilayer of milk exosomes protects their miR-cargo against harsh degrading conditions like low acidic pH of 1-2 and RNase-mediated degradation [81, 86]. Boiling of milk, however, results in complete miR degradation . Raw cow’s milk contains the highest amounts of bioactive miRs, whereas pasteurized milk contains lower levels and milk powder used for infant formula production only exhibits trace amounts of detectable RNAs [80, 81]. Milk exosome CD81: an exosomal antigen required for thymocyte maturation? The increased intestinal permeability during the postnatal period may support milk exosome traffic into the infant’s blood circulation. Intestinal cells release exosomes of 30-90 nm in diameter from their apical and basolateral sides . Milk exosomes are specifically characterized for the presence of CD81, CD63 and Hsc70 and the absence of calnexin . The tetraspanins CD81 and CD63 are also present on intestinal cell-derived exosomes  and circulating exosomes in human plasma . Blood is regarded as a physiological fluid for exosome circulation in the body supporting exosome traffic for cell-cell and organ-organ communications [67, 71–73, 90]. Importantly, exosomes have been observed in murine and human thymus [74, 91]. Milk exosomes and thymic exosomes are of comparable size and contain TSG101, CD81, CD63 and milk fat globulin (MFG)-8 [74, 83, 91–93]. A monoclonal antibody against CD81 blocked the appearance of αβ T cells in fetal murine thymic organ cultures. In reaggregation cultures with CD81-transfected fibroblasts, CD4-CD8- thymocytes differentiated into CD4+CD8+ T cells. Thus, interaction between immature thymocytes and CD81 is required for the transition of thymocytes from the CD4-CD8- to the CD4+CD8+ stage . CD81 of thymic stromal cells but also milk exosome-derived CD81 may play a role in CD81-mediated thymocyte development. MiR-155 exhibits highest expression in colostrum and is still a predominant exosomal miR of bovine whey [84, 85]. MiR-155, miR-146a and miR-21 are components of human plasma [86, 94, 95]. Human and bovine milk exosomes are taken up by macrophages and thereafter increase cellular miR levels [85, 92]. Notably, isolated human breast milk exosomes incubated with human PBMCs increase CD4+CD25+FoxP3+ Treg numbers . Intriguingly, murine thymic exosomes induce the conversion of CD4+CD25- thymic T cells into CD4+CD25+FoxP3+ Tregs in a dose-dependent manner . Thus, both human breast milk exosomes and thymic exosomes are able to induce CD4+CD25+FoxP3+ Tregs [82, 91]. We thus propose that milk may function as a miR messenger system boosting thymic Treg cell maturation by transfer of milk-derived exosomes donating miRs required for appropriate thymic Treg maturation by the evolutionarily conserved process of breastfeeding. Notably, phylogenetic studies demonstrate that miR-155 is conserved across species . There is a high homology between human (hsa-mir-155) and bovine miR-155 (bta-mir-155) (http://www.mirbase.org). Farm milk exposure increases the numbers of demethylated CD4+CD25+FoxP3+ Tregs . Stable expression of Foxp3 in Tregs depends on DNA demethylation at the Treg-specific demethylated region (TSDR), a conserved, CpG-rich region within the FOXP3 locus . Binding of the transcription factor Ets-1 to the demethylated Foxp3 gene stabilizes Foxp3 expression in Tregs  (Figure 2). Atopic individuals express lower numbers of demethylated FoxP3+ Tregs . DNA methylation is often associated with inhibition of transcriptional activity and plays a fundamental role during development and genomic imprinting . Milk, the “starter cocktail” of postnatal mammalian life, may function as an epigenetic regulator for thymic Treg maturation. There are two potential mechanisms of DNA demethylation: 1) passive demethylation through inhibition of DNA methyltransferases (DNMTs) and 2) active demethylation mediated by ten-eleven-translocation (TET) 2 and 3 . TET2 binding to CpG-rich regions requires the interaction of TET2 with the protein IDAX (also known as CXXC4) . Intriguingly, the CXXC DNA-binding domains can bind unmethylated DNA and recruit TET2 via IDAX . Both DNMT1 and DNMT3b are associated with the Foxp3 locus in CD4+ cells . Methylation of CpG residues represses Foxp3 expression, whereas complete demethylation is required for stable Foxp3 expression . There is increasing evidence that miRs modify the regulatory network of TET2 expression . MiR-21 indirectly down-regulates DNMT1 by targeting ras guanyl nucleotide-releasing protein 1 (RASGRP1). MiR-148a, a highly expressed miR-species in colostrum and mature milk [80, 81, 87], directly targets DNMT1 expression . MiR-29b, another miR species of milk , contributes to DNA hypomethylation of CD4+ T cells in systemic lupus erythematosus indirectly targeting DNMT1 . Milk-miR-mediated hypomethylation of CpG-regions of the TSDR FOXP3 locus may thus promote the final step of active TSDR demethylation. In fact, IDAX-mediated TET2 binding results in complete and permanent FOXP3 demethylation. TSDR demethylation occurs during the CD4-single positive stage of thymocytes and the presence of 5-hydroxymethylcytosine (5-hmC), a product of TET-mediated 5mC hydroxylation, within the TSDR region and the induction of TET2/3 during Treg maturation points to active TET-mediated demethylation of FOXP3 TSDR . We thus speculate that the immunoregulative miR network of milk may induce lineage-specific epigenetic modifications of FOXP3 required for long-term Treg lineage stability and atopy prevention. Proposed mode of action of milk miR-mediated demethylation of FOXP3 . Milk-derived miR-29b, -21, and -148a may reduce the expression of DNMTs resulting in TSDR hypomethylation required for IDAX binding, which finally attracts TET2 to the TSDR resulting in complete TSDR demethylation, important for permanent FOXP3 stabilization. MiR-155 inhibits suppressor of cytokine signaling 1 (SOCS1) . SOCS1 is a negative regulator of phosphorylated STAT5. TCR, IL-2 and TGF-β1 are pivotal signals for Treg differentiation associated with phosphorylation of STAT5 and SMAD5, which enhance FoxP3 expression. MiR-155-mediated suppression of SOCS1 augments FoxP3 expression promoting further miR-155 synthesis  (Figure 1). The transcription factor c-Maf promotes IL-4 expression and is induced during normal precursor cell differentiation along the Th2 lineage [107, 108]. c-Maf binds to the c-Maf response element in the proximal IL-4 promoter (Figure 3A). Importantly, c-Maf is a target of miR-155 [62, 109]. In accordance, CD4+ cells transfected with anti-miR-155 expressed higher levels of GATA-3 and IL-4 . Thus, miR-155-mediated c-Maf suppression promotes FoxP3+ Treg activity and impairs IL-4/Th2 cell-mediated atopic immune deviations (Figure 3B). Impact of miR-155 on immune regulating transcription factors. A) atopic immune deviations in the absence of miR-155 and B) non-atopic development of the immune system due to appropriate miR-155 signaling. The lipid phosphatase SHIP1 (Src homology-2 domain-containing inositol 5-phosphatase 1) plays an increasing role for immune regulation [110, 111]. Myeloid-specific ablation of SHIP leads to the expansion of Treg cell numbers, confirming the role of SHIP in the control of Treg numbers . Notably, SHIP1 mRNA is a primary target miR-155 . The transcription factor PU.1 is a direct target of miR-155 and is involved in the regulation of immunoglobulin (Ig) class-switch of plasma cells . Ig heavy chain class switching to IgE is directed by IL-4 and IL-13 by inducing transcription from the IgE germline promoter . IL-4-induced IgE germline gene transcription represents an early step during IgE isotype switch differentiation and is orchestrated by the coordinated action of the transcription factors STAT6, PU.1, NF-κB, and C/EBP on the promoter region of the IgE germline gene [115–117]. MiR-155-mediated suppression of PU.1 and c-Maf may thus attenuate IL-4-induced IgE synthesis. Notably, PU.1 cooperatively with GATA-1 transactivates the α-chain of the high affinity receptor of IgE (FcϵRI) . FcϵRI plays an important role in IgE-mediated atopic sensitization as well as in IgE-mediated atopic immune reactions. Cytotoxic T lymphocyte-associated antigen-4 (CTLA-4) is a surface molecule of activated T cells and a negative regulator of T-cell activation. The mean percentage of T cells expressing CTLA-4 in patients with atopic dermatitis was higher than in the control group . miR-155 was identified as a direct target of CTLA-4 . CTLA-4 has been shown in mice to control Foxp3+ regulatory T cell function . Pregnancy in a farm environment reduces the infant’s risk of atopic diseases [1–9]. TLR-mediated innate response pathways are believed to attenuate allergic Th2-driven immune responses . Blood cells of infants of farming-exposed mothers exhibit upregulated expression of TLR2 and TLR4 [123, 124]. MiRs are fine-tuners of TLR signaling and play a crucial role in endotoxin tolerance [125, 126]. Enhanced exposure of lipopolysaccharides (LPS) in the farm environment may result in stronger LPS-mediated TLR4 activation in monocyte/macrophages and DCs that increase expression of miR-155, miR-146a, and miR-21, crucial regulatory miRs involved in thymic Treg maturation [127–133]. Notably, activated macrophages release exosomes that can activate and recruit immune cells . Placental trophoblasts, which form the interface between the maternal environment and the fetus, on stimulation secrete miR-loaded exosomes . Low dose injection of LPS induces miR-155 and pre-eclampsia-like symptoms in the rat and elevated placental miR-155 in pre-eclampsia patients . A time-and dose-dependent accumulation of miR-155 following LPS stimulation has been observed in human trophoblast cells . LPS-stimulated placenta-derived exosomal miR-release may modify fetal immune regulation . Thus, enhanced prenatal LPS-induction of miR-155 may explain the higher Treg numbers in umbilicial cord blood of newborn infants of farming exposed mothers . LPS-mediated miR-155-expression with subsequent SOCS1 inhibition could result in robust TLR4/JAK-STAT signaling further amplifying LPS-induced miR-155 responses [139, 140]. Feeding raw, unpasteurized cow´s milk in the first year of life exerts atopy-preventive effects, increases the number and function of FoxP3+ Tregs and decreases IgE plasma levels [1–9]. Boiling of milk degrades bioactive miRs in cow’s milk . Especially the whey protein fraction of milk has been implicated to mediate the atopy-protective effect of raw farm milk [3, 8]. Noteworthy, miR-155 and miR-146a have not been detected in the lipid fraction of human breast milk . MiR-155 is expressed in highest amounts in colostrum and is a substantial component of the whey fraction of mature bovine milk [80, 81, 85]. Exosome membrane integrity is essential for the uptake of milk miRs into cultured cells . The boiling process may disrupt the lipid bilayer of milk exosomes exposing their miR content to RNase-mediated degradation. A history of breastfeeding is associated with a reduction of the risk of asthma and atopic dermatitis . Apparently, after termination of placenta-mediated signaling towards the thymus, the immunoregulatory program featured by the mammary gland may tune final miR-dependent events for the proper development of the infant’s immune system. We speculate that atopic mothers who exhibit lower numbers of FoxP3+ Tregs and who may accordingly express lower levels of FoxP3-stimulated miR-155 may provide deficient amounts of breast milk miR-155 to their infants. This may explain why atopic mothers transmit atopic diseases more frequently than atopic fathers [143–145]. Breastfeeding compared to artificial formula feeding exerts atopy-preventive effects [142, 146, 147]. Formula production is based on bovine milk protein powder, which in comparison to raw cow’s milk only contains minimal amounts of RNA . Extensively hydrolyzed formula made for “atopy prevention” exhibits the lowest miR levels compared to standard formula [81, 148]. According to the American Academy of Pediatrics Committee on Nutrition and Section on Allergy and Immunology, there is only “modest evidence” that the onset of atopic disease may be delayed or prevented by feeding hydrolyzed formulas compared with standard formula . Exosomal cargo transfer plays an increasing role for intercellular communication [149, 150]. Accumulating translational evidence sheds a new light on the potential role of milk as a transmitter of exosome-derived immune regulatory miRs for thymic Treg maturation. Milk miRs may promote the two-step selection process turning self-reactive thymocytes into stable Treg cells. TCR stimulated IL-2/STAT5 signaling may be enhanced by milk miR-155-mediated SOCS1 suppression, which augments upregulation of FoxP3. FoxP3 promotes miR-155 expression further enhancing this feed forward regulatory circuit. 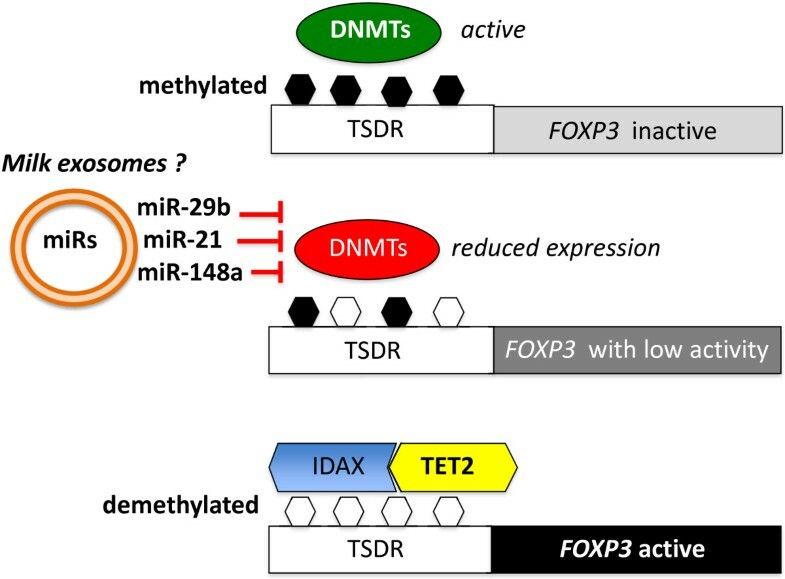 In a second step FoxP3 expression may be stabilized by milk-miR-mediated hypomethylation of the TSDR region of FOXP3. This hypomethylation may allow IDAX binding, which finally attracts TET2 promoting active demethylation stabilizing FoxP3 maturation and long-term Treg lineage commitment. Furthermore, functionally active FoxP3 Treg cells suppress the development of Th2 cell-dependent immune responses. Milk miR-155 may impair atopic sensitization by suppression of c-Maf/SHIP1-mediated IL-4 synthesis, PU.1-mediated Ig class switch to IgE as well as PU.1-driven FcϵRI α-chain synthesis. Thus, the milk miR system may not only augment thymic Treg maturation but may apparently prevent Th2-mediated atopic sensitization and atopic effector responses. 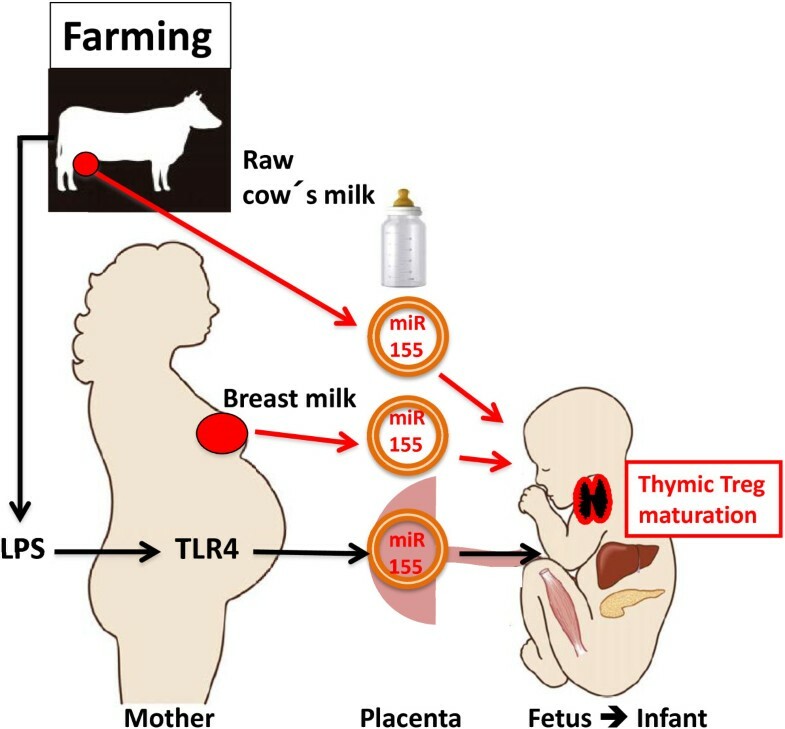 Boiling of milk obviously destroys the miR-signaling system of milk, whereas LPS-mediated miR-155 release from stimulated maternal macrophages and trophoblast cells as well as fresh cow’s milk-mediated miR-155 transfer may promote thymic Tregs maturation explaining synergistic atopy-preventive effects of perinatal farm exposure (Figure 4). Milk appears to function as an evolutionarily highly conserved miR-dependent epigenetic modifyer imprinting appropriate changes required for long-term thymic FoxP3-mediated Treg differentiation. Milk-derived exosomes in synergy with thymic exosomes may play the essential role for stable maturation of CD4+CD25+FoxP3+ Tregs, which themselves following TCR activation produce CD73-containing exosome-like structures that mediate their suppressive activity . Perinatal scenario of milk-and LPS-induced miR-155-exosome-signaling promoting thymic Treg maturation. Fetuses and infants raised in an active farming environment are exposed to abundant sources of LPS and raw cow’s milk that either stimulate or provide miR-155 compared to infants raised under civic conditions and artificial formula feeding. Obviously, atopic individuals are “Treg weaklings” exhibiting lower numbers and function of FoxP3 Tregs compared to non-atopic subjects. Breast milk of atopic mothers may thus provide less FoxP3-induced miR-155 explaining the increased maternal transmission of atopic diseases compared to the lower paternal atopy transmission. Accumulating evidence supports our concept that milk’s exosomal miR system may represent “the missing candidate” inducing the atopy-preventive effects of raw cow’s milk consumption (Table 1). Deviations of miR processing and miR-regulated transcriptional activity may play a future role for a deeper understanding of the immunopathogenesis and treatment of atopic diseases. Future prevention of atopic diseases might be possible by addition of appropriate miR-155-enriched exosomes to artificial infant formula. BCM performed translational research and wrote the manuscript. SMJ proved the data on atopy epidemiology and GS analyzed the data on exosome microRNA biology. All authors read and approved the final manuscript.